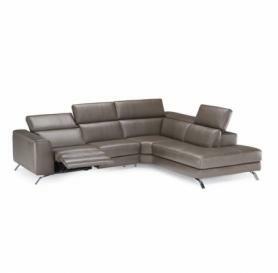 Luca from Natuzzi Editions is a hand crafted work of art in it's design simplicitiy. From it's appearance one may find it difficult to comprehend that this sofa may contain electrically reclining motions and independently controlled electrically rising headrests. The discreteness of the motions is achieved by a 2nd foot rest panel appearing from up and under the seat and adding to the whisper quiet motion gliding forward. If this wasn't enough the headrest can be controlled electronically and independently to the foot rest via four metal buttons located on the inside arm. Click the PDF icon on the right to download the datasheet for the Natuzzi Editions Luca. 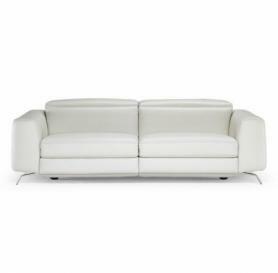 Luca Sofas IN STOCK and ready to deliver! 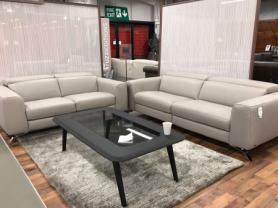 Sofas from the Luca range can ordered and tailored to your specific requirements. Available in a range of sizes, leathers and fabrics.